Reprinted from the Spring/Summer/Fall 2003 Journal of the South Carolina Native Plant Society, and used by permission. When the first warm day in March finally arrived this spring I was out in the woods, sort of. I chose to visit one of my long-time favorite spots Glassy Mountain. This is a fantastic spot to take a short, non-strenuous walk with the family and see lots of unique native plants. It may be best visited in April but is a nice choice at any time of the year. Glassy Mountain is a piedmont monadnock (an isolated mountain in the piedmont) which is a very familiar landmark to those living in and around Pickens, SC. The heritage trust program operates a heritage preserve around the top of the mountain which is approximately 65 acres in size. To reach Glassy Mountain Heritage Preserve take SC 183 east from SC 8 for approximately 1.5 miles, turn left on South Glassy Mountain Road and travel approximately 1.1 miles to Glassy Mountain Church Road, the parking area and trail head is located at the top of Glassy Mountain, close to the radio towers. The trail head is found to the right of the towers at the edge of the parking lot. Before starting up the trail it might be worth while to take a look at the granite outcrop that is just below the road shoulder approximately 100 feet back down the road, below the parking lot. This outcrop is easily accessed and provides a great place to visit some of the species which are typical of granite outcrops in this part of the state. One of the most apparent species here is Beargrass (Yucca filamentosa) which forms a large clump just below the shoulder of the road. 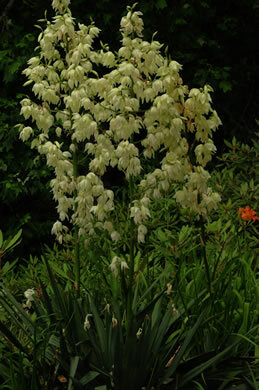 If you're here in the summer, this plant will probably be displaying its large cream-colored flowers. The flora on the outcrop is reminiscent of desert flora in that many succulents and drought-adapted or drought-escaping species are present. Also flowering in the summer is the bright magenta-flowered Appalachian Fameflower (Talinum teretifolium). 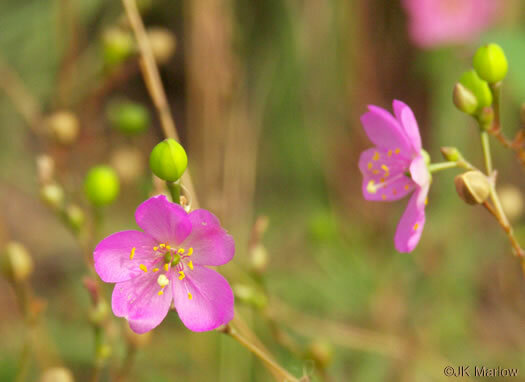 This plant might remind you initially of a portulacca, a close relation of this beautiful native. The flowers of this plant open around 3:00 in the afternoon and remain open until around 7:00 pm. You might also observe that there are cacti here! 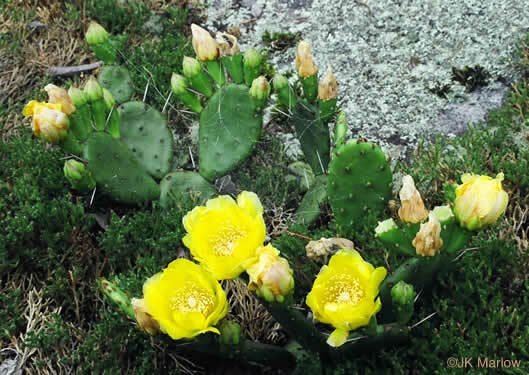 The Common Prickly Pear Cactus (Opuntia humifusa) is abundant in shallow-soil mats around the junipers and pines. 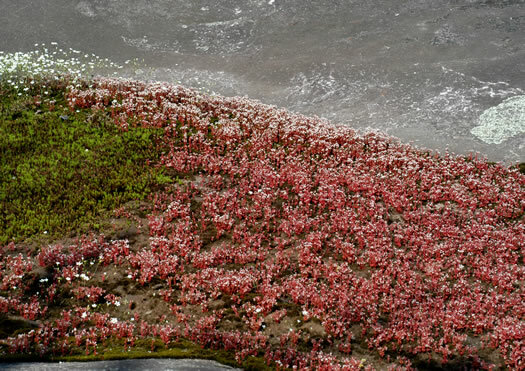 In the spring the tiny red plants with bright white flowers found towards the base of this outcrop cannot be missed. These are the dainty little Elf-orpines (Diamorpha smallii) which are annual species that sprout in the fall and flower before the hot, dry weather arrives in the spring. Two unusual species of fern may be seen on this outcrop as well, the Lipferns (Cheilanthes tomentosa and C. lanosa). These ferns are not growing where you might expect a fern! These are dry-land ferns which range into the driest climates of North America. They find a nice home on the exposed shallow soil of open rock outcrops in our area. The bluish-colored tight clumps are Cheilanthes tomentosa and the darker green less tightly clumping species is C. lanosa. After spending some time looking around the rock you should check out the trail itself. The trail begins in a fairly dry, open Chestnut Oak forest along the peak of Glassy Mountain. This forest type is often referred to as a monadnock forest, due to the fact that it is a common association in such places. The most abundant species here is Chestnut Oak (Quercus montana). Initially this trail does not offer much in showy wildflowers or herbaceous species, but as you continue downslope the forest becomes dramatically more rich in herbaceous species. In the spring the woods here are filled with the glowing yellow flowers of Round-leaf Groundsel (Packera obovata). This plant, which is a rare relative of the common groundsels seen along roadsides in the spring is restricted to sites with rich, circumneutral soils in South Caorlina. The soil here is surprisingly rich. Glassy Mountain is a good example of the "calcareous variant" of the Low-elevation Granitic Dome. The rock here has weathered to produce a circumneutral soil which harbors some very interesting species. 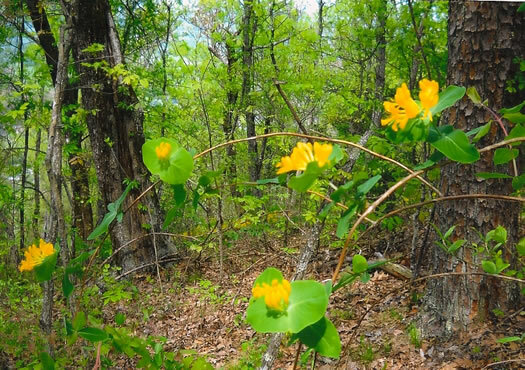 In April the showy yellow tubular flowers of Yellow Honeysuckle (Lonicera flava) are unmistakable in this woodland. This is yet another species which is dependent upon the rich soils. Other calcium-loving species are apparent such as Southern Sugar Maple (Acer barbatum) and Basswood (Tilia americana var. heterophylla). One of the most beautiful species to me in the spring is the Painted Buckeye (Aesculus sylvatica). In North Carolina and in other areas of South Carolina this species produces rather dull, green flowers, but here at Glassy this species shows a rich salmon to red coloration and what an outstanding show it is! The rich woodland continues for a short distance until you emerge onto the top of a very large, open rock outcrop. This is extremely dangerous territory, so don't venture out on this steep rock. You can see all the interesting species from the trail. The woodland edges around the rock outcrop are quite open and grassy and contain numerous showy species. Large-flower Tickseed (Coreopsis grandiflora) is apparent in the later part of the spring and if you arrive in the earliest part of spring you might be lucky enough to catch the Dimpled Trout Lily (Erythronium umbilicatum) and Virginia Spring Beauty (Claytonia virginica) in flower. Most of us are probably familiar with these species from stream bottoms and moist coves, but here on Glassy they occur on shallow-soil mats right out in the open on the outcrop! At least two species of Spiderwort (Tradescantia) make their home in this grassy woodland. The showiest of these is the Hairy Spiderwort (Tradescantia hirsuticaulis) whose short stems sport very large blue to neon pink flowers which are open from midmorning to very early afternoon. 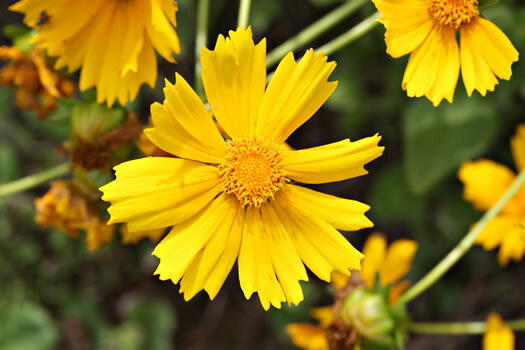 This plant flowers in the spring and may flower again in the fall if conditions are right. In this area you should also watch for the American Alumroot (Heuchera americana) with its mottled foliage and tiny, open panicles of greenish-white flowers in the spring. 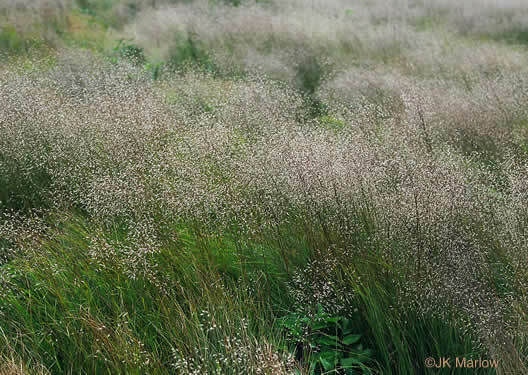 The grass species which is so abundant here is Hairgrass (Deschampsia flexuosa). The extremely narrow leaves and tightly bunching habit of this cool-season native is diagnostic. It is much more abundant at high elevations in North Carolina, but has a large disjunct population here at Glassy. One of the most important species to grow at Glassy Mountain is the Divided-leaf Ragwort (Packera millefolia) which is a very uncommon species that is regionally threatened. It has leaves resembling a yarrow (Achillea millefolium) and produces a mass of bright golden flowers in the spring and early summer. It is found only near the Blue Ridge escarpment on granitic outcrops in our area. Several “unofficial” trails lead off of the designated trail and traverse the open woodIands and outcrops, but the visitor is advised to stay on the trail to avoid causing damage to the fragile plant communities found here. Back at the parking lot you might want to check out the ruderal species near to the radio tower and along the roadside. One species in particular, Standing Cypress (Ipomopsis rubra) produces stunning red trumpets of flowers here in the summer. These flowers are visited by hummingbirds and are extremely photogenic. The next time you have a few minutes to spare take a trip up to Glassy Mountain. It's a fantastic place to see a lot in a short time. One word of caution, don't be surprised if you end up sharing the trail with chickens and a goat or two! This is just part of the Pickens County “charm”!